Selecting the perfect countertop edge profile can be just as big of a decision as the counters themselves. With a seemingly endless number of options to choose from, it can be a difficult task to determine what is the best fit your marble or granite countertop project. Being knowledgeable about the form and function of different edges will have you feeling confident when you make your final selection at your natural stone fabricator. It will even open up some creative designs ideas, such as pairing some popular edge profiles together for a unique and decorative style. 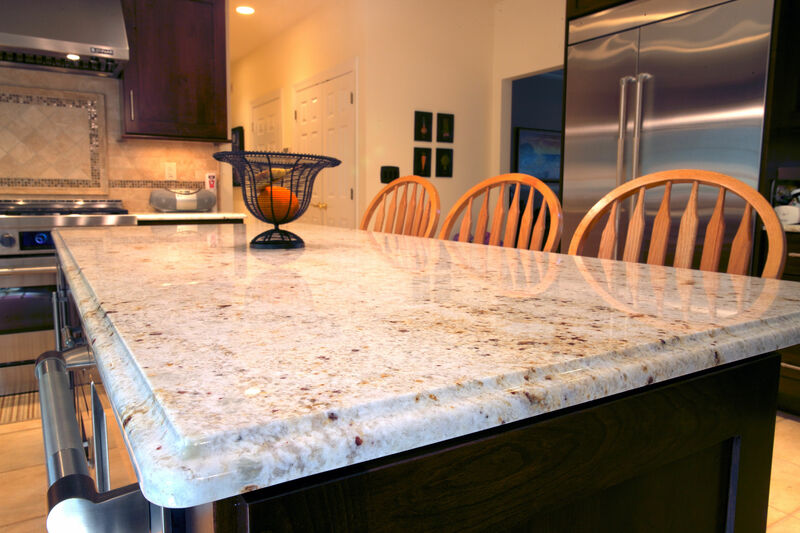 There are several factors to take into account when considering edge profiles for your countertop. First is style. The type of edge profile should match the style of your project. For modern and contemporary decors, Straight or Quarter Bevel edges are ideal because they provide clean lines and sharp angles, which are concomitant with these design schemes. For modern vanity granite tops in master bathrooms, Quarter Round can also provide a stylish look. More intricate edges like Cove Bullnose, Cove Ogee, or Cove DuPont will compliment the look of a Traditional setting because of their regal appearance. Traditional kitchens are known for eye-catching architectural and decorative features that are both elegant and distinguished. Elements such as chandeliers, crown molding, and extravagant overhangs will all be flattered by the curved natures of the edge mentioned above profiles on all traditional countertop colors. Another component to take into consideration is the function of the space. Simple, rounded edges, such as Quarter Round, Half Bullnose, and Full Bullnose will be better suited in high-traffic areas more so than edge profiles with radical angles. If children are frequently in your kitchen, then a straight edge for your granite countertops is better off avoided to prevent any potential injuries. Although, these two kitchen styles are popular, in our experience here at Marble.com, rarely do our clients rigidly stick to any one genre in particular. We often see kitchens that are primarily traditional in style but use modern, straight edges for their granite counters. Alternately, a homeowner may have a modern-style kitchen and use quarter round edges instead of the more common angular edges. What is important to remember here is that the rules are meant to be broken. If you have designed your kitchen in one style, don’t feel obligated to choose an edge based on that décor’s standards if there is a different edge you like more. The level of maintenance required for your edge profile may also influence your choice. The basic rule is that simpler edges require less maintenance, while dirt and dust can collect in the complex edge profiles. With that in mind, we recommend more complex edge profiles for areas of lower traffic, such as master bathroom vanity granite tops. At Marble.com we are also able to create custom edges that no other countertop fabricator would ever dream of being able to do. When it comes to countertop edges, if you can dream it, we can make it--the possibilities are truly endless. Whichever combinations of stone, color and edge profile you choose, Marble.com’s computer-controlled state-of-the-art machines, which give a perfect edge for granite countertops every single time.